After just missing out on the 2012 Olympics, Brendan McHugh C’12 wasn’t sure what would happen to his athletic career, telling the Gazette only that he would “try his best” to keep swimming competitively. Two years later, he’s doing a lot more than that. With his eyes firmly trained on getting to the 2016 Summer Olympics in Brazil – and perhaps helping to continue Penn’s remarkable Olympic streak – McHugh set a new U.S. Open record in the 50-meter breaststroke last week at a meet in Irvine, Calif.
That record-setting time of 27.10 seconds came in prelims of the 2014 Phillips 66 National Championships. 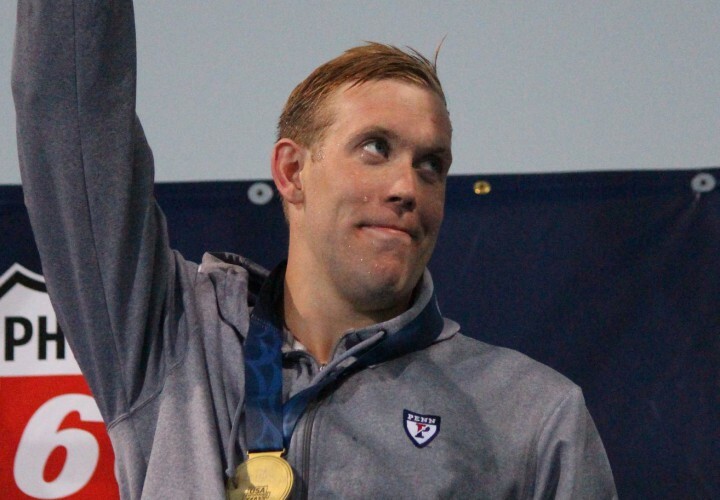 McHugh, representing the Greater Philadelphia Aquatic Club, then won the event with a time of 27.24 in the finals – an upset that punched his ticket to the 2015 World Aquatics Championships in Russia. And, perhaps, most revealing, here’s a slightly older video shot a few months before the meet in Irvine in which McHugh talks about his past accomplishments and his future goals in the pool. His goal this year was to break the American record in the 50-meter breastroke (Mark Gangloff’s 26.86 at the 2009 World Championships). He didn’t get that one but he was certainly close, settling for the U.S. Open record (which was previously held by Kevin Steel with a time of 27.26). He’s working at a law firm in Philly this summer and has been training at Penn. He also plans to train at Penn leading up to the Olympic Trials because “they really know how to get me going” and he’d be nervous to go somewhere he’s not familiar with. At the time of that interview, many people probably didn’t know much about Brendan McHugh. But now the Penn grad will be swimming in Russia next year – and he suddenly looks like a pretty good bet to get to Brazil the following year too. Dave; Just an FYI- the 2016 Olympics are in Rio- Brazil. Whoops, that was a brain fart. I’m in World Cup mode still, I guess. It’s been fixed. Thanks a lot for pointing that out!